Starting today, you can buy any of 275,000 items from the Plano, TX-based retail giant from within the social network. When the world went online, brick-and-mortar stores opened up websites. When the world started going mobile, retailers followed them to their phones. Now that the world is moving to social networks, stores are following them there too. 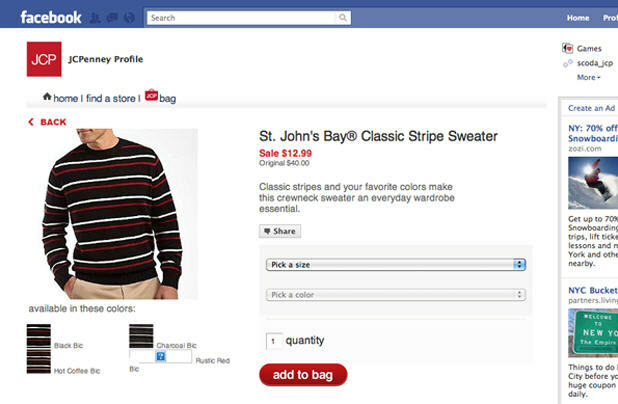 Today J.C. Penney became the first major retailer to make its entire catalog available to shoppers within Facebook—not just to peruse, but to buy. Starting now, you can purchase any of the 250,000 items that the department store sells online from its Facebook page. The company expects many sales will take place as a result of shoppers seeing items listed in their friends’ news feeds and then clicking through to the product pages, still within Facebook. Other companies have started selling from within Facebook, but it doesn’t appear that any have done so as extensively as J.C. Penney. Proctor & Gamble offers Pampers diapers within the social network, and 1-800 Flowers has made a selection of their bouquets available there as well. But J.C. Penney has pushed its whole catalog to the network. Anything you can buy at the company’s website is now available within Facebook. J.C. Penney expects that the new channel will give it more information about its customers, which could influence future marketing and product choices. “All of the information that Facebook has about people can be aggregated into analytical data,” Taylor said. That includes the ages of their customers, what sorts of products they share with others, and how often they peruse the store’s offerings. “The interesting additional information they’re going to get could affect their decision-making,” Taylor adds.